On 4th September, Indian author Sushmita Banerjee was shot dead by turbaned men in Kabul, where she was involved in health care, and in documenting the lives of local women. Her killers were probably the Taliban. She was widely denounced by fundamentalists in Afghanistan for her work promoting women’s rights, and she had attracted the fury of the Taliban after she wrote the memoir Kabuliwalar Bangali Bou (A Man From Kabul’s Bengali Wife). 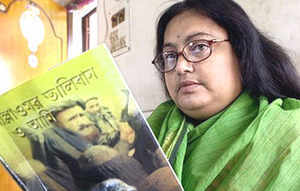 It told of Banerjee’s love marriage to the Afghan businessman Janbaz Khan, her moving to Afghanistan in 1989, the adversities she faced under Taliban rule and her eventual escape back to her native Kolkata. She had only recently returned to Kabul when she was shot. Her publisher, Swapan Biswas, told The Times Of India she had informed him about her plan to return to Afghanistan in February to start work on another book: "She was determined to go back for the book which she wanted me to publish." Banerjee followed up Kabuliwalar Bangali Bou with more volumes of memoir, and general commentary: Talibani Atyachar, Deshe O Bideshe (Taliban Atrocities In Afghanistan And Abroad), Mullah Omar, Taliban O Ami (Mullah Omar, Taliban And I) Ek Borno Mithya Noi (Not A Word Is A Lie) and Sabhyatar Sesh Punyabani (The Swansong Of Civilisation). According to India Today, Kabuliwalar Bangali Bou initially sold seven lakh copies, including “over one lakh copies of a somewhat amateurish English version.” 1 lakh = 100,000. I haven’t been able to track down a mainstream, easily available English language translation of Kabuliwalar Bangali Bou, or translations of Banerjee's other titles but I hope her work does now find an international publisher, able to distribute her books, and to promote them. This butchered woman sounds like an author we all should read.